Flying in, I saw again how undeniably beautiful this state is. I’d been to Nevada before, but it seemed fitting to admire it anew on the way in. To me, it promised to be a great place for new, progressive ideas and, as you’ll see, it didn’t disappoint! ITC is a good place for meetings, and many people had them all day. This is great for connecting and believe me, DataCubes saw lots of benefit from it, but the other side is you end up missing some sessions and other parts of the conference. It’s a tradeoff but I’m not sure if it could be done any other way. The founders of ITC, Jay Weintraub and Caribou Honig, put on a great show. Just the sheer size of this room made a statement on how big of a movement is happening in Insurtech. Both founders offered dynamic insights and spelled out the clear trend that insurers get it, investors get it and startups are making it happen – it’s time for change. 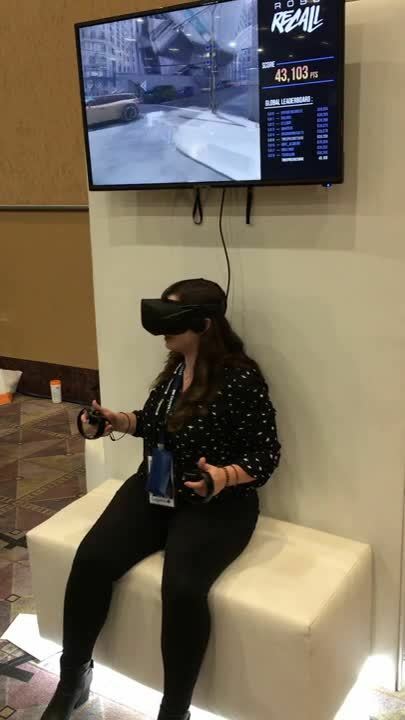 Why have VR gameplay at an insurtech conference? Because we can. Machine Learning / AI – I can say from the 30+ discussions I personally had on the topic as well as the response DataCubes is receiving from the market overall that machine learning is already transforming nearly every aspect of insurance. This is by far one of the biggest areas of executable opportunity for insurers today. AI is today what hardcoded automation was in the 80’s. Chatbots – Still working on getting there, with some companies closer than others. I have no doubt this area of innovation will be one of the game-changers over the next decade. Home telematics – Many companies are making a play here now, despite the major challenges that come with it. From detecting water leaks to measuring the health of the property through thermostats and smart batteries – I think there’s a lot to explore here and it will remain complicated. Drones – Now a mature idea from years ago but it’s clear this technology has a lot of life left in it. It’s becoming easier to get and use drones to improve insurance inspections and area assessments. Company 1 – “We don’t know, we just say blockchain because it gets media attention.” – You can argue the morality of such an approach, but at least we can understand this use case! Company 2 – “I believe consumers will use blockchain to protect their identity.” – This seems like a rough path for a startup because it’s based on principle, not practicality. It’s hard to monetize principle on its own. Company 3 – “We are using blockchain to help facilitate the reinsurance process.” – There may be something here, but I encourage anyone looking at blockchain to first ask why it cannot be done without blockchain. If that question can’t be answered, then you are probably better off going with a more traditional architecture. A big thank you to Vlad Stojanovic and his team at Oliver Wyman for selecting DataCubes (yours truly) to interview at the event. During the interview, Vlad and I had a good chat, including topics like insurtech trends, opportunities and best routes forward. I think many insurers will benefit from looking for “small bets with high impact” vs. “big bets with unknown impact”. The former can get you tangible results quickly while the latter is often a big risk for an unknown reward. I’ll post a link to the full interview once released. If you attended ITC this year, what were your thoughts?